Here are the photographs from this trip. As I mentioned before, I'm not going to spend time trying to convincing anyone to vote for Dean. I'm just letting you guys know who I'm endorsing and why, so you can take that into consideration when deciding for yourself. Over the coming weeks and months, I'll be providing more details about Dean and his current stance (and past accomplishments that back up that stance) in Health Care, Education, Civil Rights and other domestic issues that I feel are the crux of this election. Read the individual description of each. I've created a couple different edits so you can see and hear as little or as much as you want. 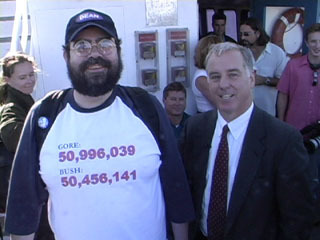 Here's me talking to Howard Dean before he gets on the Ferry to Larkspur. 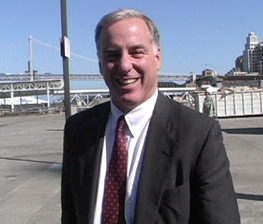 He mentions the 34,000 meetup.com supporters and Howard Dean TV. He says hello to people in the downstairs cabin and heads out to the front deck of the boat, where he remained for a good part of the ride. 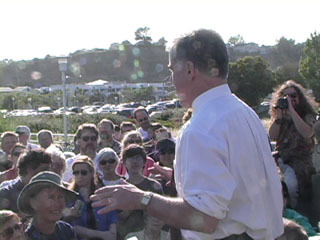 Long Version: The crowd gets off the ferry, my running through the crowd to find a spot to film the speech, and the entire speech itself (give or take a second). Short Version - everything included in the "Long Version," but a little less of it.